Does your dog love the outdoors, no matter the weather and his paws are often unprotected? Learn how to keep your puppy's paws happy and healthy with these easy-to-follow tips! How to protect dog paws from winter and snow? Winter can be a tough time for your dog. Exposure to chilly air, rain, and snow can cause chapped paws and itchy skin. But these aren’t the only discomforts dogs can suffer from in winter…here is an overview of more winter hazards for your dog. The salt used as an ice-melter on roads and sidewalks is very tough for a dog’s paws, and nice winter walks can become downright dangerous if your dog licks the chemicals from ice-melting agents. Paw care makes your dog more ‘pawsitive’, so do it regularly. 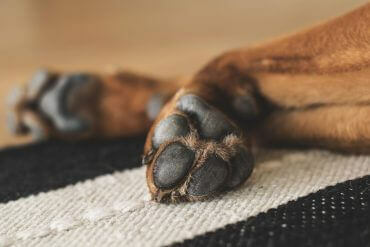 Furthermore, there are some very easy-to-follow basic tips on how to protect your dog’s feet. Get familiar with them. First of all, make sure the paws are ready for the winter. Good grooming is essential for healthy winter feet. 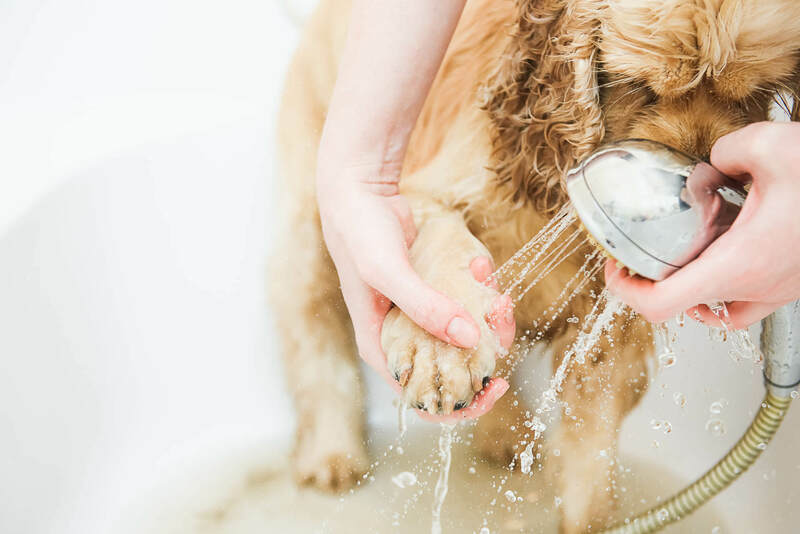 Trim long-haired dogs to minimize the clinging of ice balls, salt crystals and ice-melting chemicals that can dry on the skin – especially on the feet. If your dog has very hairy feet, trim them throughout the winter. When you’re walking in the city, avoiding all the rock salt is almost impossible. Keep a bowl of warm water just inside your door so that you can wipe your dog’s paws (and your own boots) when you are back home. Dogs left in the cold for long periods of times are also at risk for frostbite on paws and hypothermia. It is not advised that dogs spend hours in the cold. In winter, frequent short walks are better for your dog than a single long walk. Last but not least, get familiar with the possible dangers of walking your dog in the dark. Bring a towel on your walks to clean off salt crystals and other chemicals. Be aware of cracks in paw pads or redness between the toes. Just as wearing boots in the winter protects your feet, dog booties will prevent injury to your dog’s paws. Good to know: Dog boots protect your dog’s paws from salt, ice balls and sharp items that may be hidden under the snow. Your pup may not like the boots in the beginning but, with a little time and patience, you can train your dog to love wearing his booties! It’s good to remember that if the weather’s too cold for you, it’s probably too cold for your dog too. Our furry companions should remain indoors as much as possible during the winter months and never be left alone in vehicles when it’s really cold. You don’t know how cold is too cold for your four-legged sweetheart? Check this infographic to find out! During winter time, try to care for your dog’s feet like you do your own. When your feet get cold, sore, and blistered, the discomfort can make you miserable. Your dog feels the same way. Mix all ingredients together in the glass and put them in a heated water bowl at 50 degrees for approximately 30 minutes. When you notice that the cream gets a medium consistency (not too thick and not too liquid), take it out, put it in another glass and leave it to cool down. All these ingredients are very powerful when used together: some of them have anti-inflammatory properties, while others have a calming effect on the skin. You struggle with removing hair from your dog’s paws? Here is a step-by-step video on how to deal with it easily! Like what you’ve read? Share it with other dog lovers!